Tektronix, Inc., the world's leading manufacturer of oscilloscopes, has unveiled the THS3000 handheld oscilloscope series that bring a new level of measurement precision and accuracy to engineers and technicians who need to debug, install and repair complex electronic systems in both field and lab environments. With up to 200 MHz bandwidth and 5 GS/s sample rate, the THS3000 oscilloscopes are the highest-performing handheld oscilloscopes available today. In today’s world, engineers are often called upon to measure a variety of signals in variety of settings. For many industrial, power generation or power efficiency applications, measurements can include digital and analog control signals made in conjunction with high voltages and currents and often, these measurements are not only made in the lab but also in the field. Another critical factor for making high voltage and current measurements is isolated inputs that are needed to minimize operator risk. The THS3000 delivers on all of these market needs with a combination of performance and ease of use packed into a compact, rugged chassis design. With a weight of 4.8 lbs, seven hours of battery life and four isolated channels, the rugged yet lightweight THS3000 series is built for use in even the most demanding conditions. Models are available with either 100 MHz and 2.5 GS/s maximum sampling rate or 200 MHZ and 5 GS/s sample rate performance. With a 10,000-point record length per each of four channels, users can capture extensive signal information at high sample rates to see signal details clearly. Each channel on a THS3000 oscilloscope is isolated from the chassis ground and from each other. Further, the external USB inputs for data storage, instrument setups and PC communication are also isolated. This enables the user to safely make floating measurements for voltages up to 300 VRMS CAT III when using the included 10X probes or 1000 VRMS CAT II with optional probes. The instrument has 600 VRMS CAT III rated inputs (BNC to earth ground) for safe high voltage measurements. Handheld oscilloscopes are often used to perform power measurements on motor drives, power converters/inverters and power semiconductor devices. 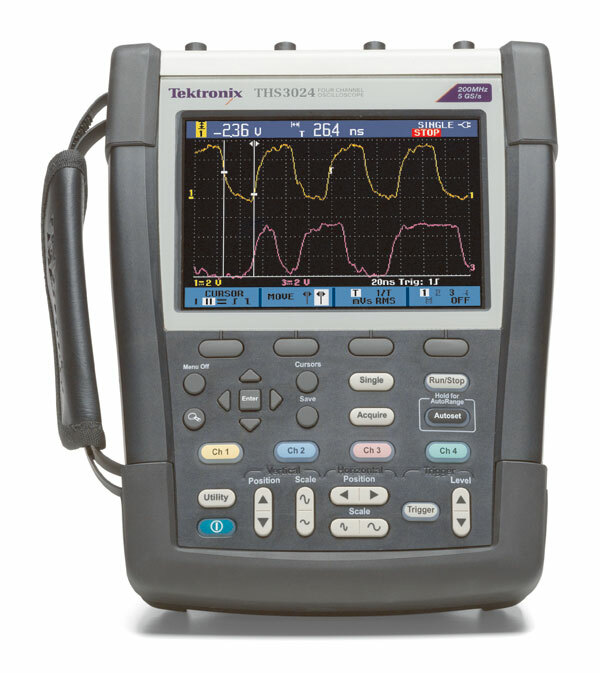 The THS3000 series is equipped to handle these measurements when coupled with the broad selection of voltage and current probes from Tektronix. Each of the four input channels can be configured to match the probe type and attenuation ensuring correct measurements and cursor readings. The THS3000 oscilloscopes provide an intuitive user interface consistent across the full range of Tektronix oscilloscopes. For initial setup or for situations where connections points are constantly changing, the THS3000 Series offers single-button Autoset and Autorange features which can automatically set up the trigger system and adjust vertical and/or horizontal oscilloscope settings. The THS3000 Handheld Oscilloscope Series will be available worldwide starting in December with a starting price of $3,950 U.S. MSRP. All models will include four 10X passive probes, 7 hour battery, a three-year warranty and OpenChoice desktop software. A travel kit with a hard-sided carrying case is optional. Wonder what else Tektronix is up to? Stay up to date on Twitter and Facebook.